Indian Summer has been both a blessing and a curse. While I have more than enjoyed October thus far with temps in the 70's and 80's, and simply amazing weather, it has left me ill prepared. I am heading north this weekend and the forecast is less spectacular. The further north we go, the worse it gets. No shorts and flip-flops, but boots and jackets and I have one in mind that should fit the bill. 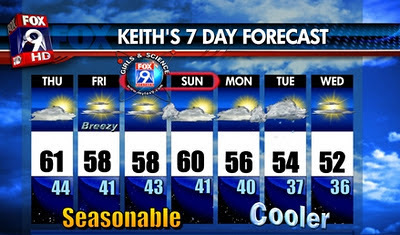 Twin Cities weather forecast... subtract 10 to 20 degrees where I'm going. Weather this time of year varies so much from day to day, even hour to hour. When you head out it will be chilly, then it will warm up, then the wind will pick up. You just have to be ready for anything. Rab's Xenon Jacket is simply a great "In Case of Emergency - Break Glass" option. Warm and light and packable, brilliant! Let's start with warm. It was surprisingly so, especially for how thin it is. Wind blocking was noticeably better than a soft shell or fleece, providing a warm little cocoon when it's zipped and the hood is up. I would say the comfortable range for this jacket would be from right at freezing up to about 60 degrees. It would be capable of going lower if you layer underneath. 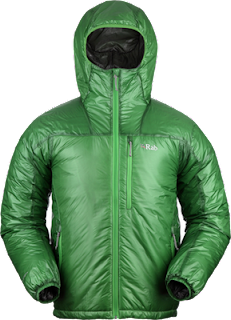 Rab utilizes super light Primaloft 60g insulation material to trap the heat in, and keep weight to a minimum. Did I mention this thing is light? I mean really light. It literally weighs only 12 ounces. For a little perspective, the North Face Denali Fleece (25.7 ounces) weighs over double the Xenon jacket . Rab looked for the lightest materials they could find when designing this jacket, and they found them. The exterior is made from 10 denier rip-stop nylon, that feels paper thin. I was worried that durability would be an issue, but after a number of outings and a rain-shower of cedar sparks from the campfire, I couldn't find a single hole in the shell. The whole jacket packs down and zips into the chest pocket for ultimate portability. You can literally clip this thing to your pack or hang it on your belt-loop and never notice it's there. Uber packable makes this a go-to option for fluctuating conditions. If you are looking for a belay jacket, or something you can stick in your glove box for those impromptu adventures, look no further. It is amazing how many times I have grabbed this jacket on my way out the door thinking "I probably won't need it", but gave myself a big pat on the back when I did.